I become lucid. I am in a huge, old, wooden house. I can see the terrace a few meters away, and beyond that, I can see rows and rows of mountains half-covered with fog. I start walking towards the terrace, and suddenly a man in a black cloak appeared in front of me. He says something about making me lucid throughout the whole dream if I agree to give my soul to Lucifer. I think to myself, what the hell, it's a dream anyway. So I say yes. He vanishes in an instant. I go out and look at the mountains. They are quite magnificent. The dream is extremely vivid and I can even feel the cold brought about by the fog. I think about my goals and remember the basic ToTM which is to let it snow. I know I have already done this a few weeks ago, so I decide to change it up this time. I put my arms out in front of me, and start moving it as if I were erasing something on the blackboard. As I am doing this, I am actually erasing the fog from the dream scene. After all the fog disappears, I try to make it snow by willing it with my mind. At first, it doesn't work, so I decided to try something else. I shake both of my hands for a few seconds (like after you wash them and you shake the excess water off). Amazingly, it starts to snow! I imagine the snowflakes having different colors, just to make it interesting. Little by little, snow starts to fall in different colors – blue, yellow, orange, green, etc. I realize that they kinda look like cupcake sprinkles falling from the sky, but they are cold as ice, and they lose their color the moment they come into contact with another object (like my hand or once they land on the terrace). I look out at the mountains and indeed, they are covered in a thin, white sheet of snow. I go back inside the house, and a DC greets me by asking how I just did the snow thing. I tell her it's magic, and she runs off yelling things like "I knew it! It exists!". I think about doing the aurora borealis task, but I realize that it is still snowing outside, and it might be hard to make a scene change. I decide to go through a door, and hopefully come out on the other side in a nighttime setting. I'm not quite sure what happens next. I remember going through the door and it being nighttime, but some DC starts asking me things about plastic bottles, and I guess I lose lucidity some time in between. I walk away from the stall and think about my next task – hunting a turkey. But before I could do anything...ZAP! The turkey stops by one of the ATM's in the far corner, a few feet from a dude withdrawing money from the machine. I am about 75 meters from it. I aim my crossbow at the turkey, and I fire away. There is a distinct snapping sound as the arrow shoots into the air. I realize I'm a really bad shot, because I didn't hit the turkey. Oh sh*t I just hit the dude. He limps down to the floor without a sound. Without a second thought, I aim the crossbow at the turkey again, with a new arrow magically in place. I fire, and imagine the arrow hitting the turkey. And it does. The arrow pierces the turkey's throat, and it falls to the floor, dead and bloodied. I run up to the turkey (who cares about the dude? ) and I grab it by the leg. Then some bystander who watched the whole thing yelled "WHAT ABOUT THAT POOR MAN YOU SHOT!?" I turn to the bystander, take a step back, and throw the dead turkey at him. He runs away, and I start walking away too, thinking about the awesomeness of what I just did. I walk to one of the food stalls, looking for something to drink. There is nothing particularly on my mind, so this must be why I start to lose lucidity and eventually drift into a short nonlucid about my family before I finally wake up. I start to notice myself waking up for real. The dream starts to fade and I start hearing ambient noises from the outside world. With my eyes closed, I move my real arm a bit, for comfort, without thinking too much about it. I focus on the the dream and slipping back into it. The ambient noises start to fade and I am once again inside the dream scene – fully lucid. I walk outside my house, thinking about my goals. I remember the TOTM. Immediately, I hear the sound of sirens from a distance. I look, and I see that people are running around in a craze. I notice that there are some people walking really slowly, dragging their feet. ZOMBIES! Their faces look disfigured, and utterly horrifying. Saliva is dripping from their mouths, and their skin has a certain pallor to it – with small holes secreting pus. I have second thoughts about my plan. Even though I know it's a dream, I don't think I can do it. I realize I can't change the dream scene, so I run toward my house, hoping to teleport through a door. As I am running, somebody grabs me by my left arm and pulls me, making me fall to the ground. It's one of the zombies. I push him away, which is easy because he doesn't seem to have much strength. He grabs my right leg and bites me above my ankle. I could feel the squishiness as his teeth make contact with my skin. I cry out in pain – it feels like he just tore off a chunk of my leg. I realize he actually did. There is a gaping hole, and to make things worse, the zombie spits into it! WTF. I kick him in the face, and run to the door, limping. I get inside and I totally forget about teleporting through the door, so I just end up in my living room instead. By the time I look back, the door is gone (along with the other doors) and there are no windows anywhere too. The floor turns into soil. The furniture is still there though. I look at my ankle, but the bite mark is gone. I walk to one corner, where there is a full-length mirror. I look at myself. My eyes are starting to look green, my eyelids feel so droopy, and my jaws feel slack. My skin is turning pale and rough, and it's very itchy too. It's that type of itch where even if you scratch it, it feels like it's never the right spot, and it never goes away. It isn't painful, but it feels uncomfortable. I wake up in my room. For real. We are going somewhere. I suspect we are going on vacation because I am carrying a big and heavy bag. I am also wearing a shirt that has a beach drawing on it. I reach the front door and start wearing my black school shoes. Wait... School shoes? Why would I be wearing school shoes to a family vacation? I go lucid. Yes! It's a dream! Finally, a lucid! I start to get giddy and excited. The dream starts becoming blurry, and starts to go black. I can feel my physical body waking up, which is evident in the slight tingling sensation all over. I hear a pop, and I know I am awake for real. I stay still, but my legs feel so uncomfortable, so I fold my right leg like I always do. I also shift to my right a bit -- all the while visualizing the dream I just exited. I start getting imagery of the previous dream, right where I left off, at the front door. It gets more vivid every second, until I am just sort of...there. I look down and see my dream hands and body, and yes, I am wearing my school shoes. I remember immediately a task I am supposed to do, which was assigned by another member in a little game we made. The task is to slide down a waterfall in any way I want. I close my eyes (the most efficient means of changing the dream scene for me) and imagine being at a riverbank which leads to a waterfall. I open my eyes and voila! I am at the riverbank. I can hear the loud rushing of water from the river, which is connected to a waterfall somewhere to the right. The sound is quite deafening too. I remember feeling a bit uneasy at sliding down a waterfall. I am a good waterbender in the dream world, but I am still afraid of heights, somewhat. Man up, biotch!, I literally think to myself. I take off my shoes and jump in the river. Instantly, I feel myself being pulled towards the waterfall, and the current is so strong that I have second thoughts about finishing the task. I am doing this. I am doing this, I think to myself as I go over the edge. I have a rush of adrenaline as I start falling down. I feel pumped and proud of myself. I realize the waterfall was very high up, and the base was so far down that the trees near it look like tiny specks. My head starts hurting from the water above me which is hitting it. The waterbender in me probably took over, because I suddenly start twirling around, creating a small whirlpool as I am cascading down the waterfall. It feels amazing. I reach the bottom, and splash into a large pool of water, dissipating the little whirlpool I built. As I float to the surface, I look back at the huge waterfall. Suddenly, a girl with long hair covering her face floats up in front of me. I am a bit shocked. 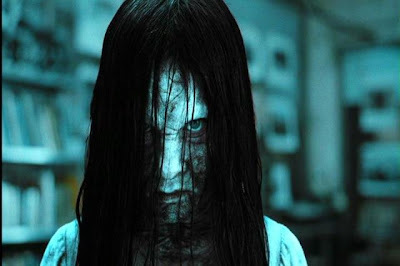 I know her as Samara from the movie The Ring. Oddly though, I don't feel any fear at all -- more of annoyance because she is invading my awesome dream. In a split second, she reaches out and grabs my hair, and tries to drown me. I go down a few inches into the water, but I know it's a dream, so I breathe easily. While I am underwater, I push my hands out and waterbend Samara far away from me. She vanishes, only to reappear once I resurface. She tries to drown me again, but I am getting furious that I reach out to her and grab a handful of her hair. I shake her head side to side and then I push her down into the water. Once she's underwater, she squirms beneath my grip, but I don't let go. This is kinda fun, actually. I start climbing on top of her with chunks of her hair still in my hands, and her underwater. I wake up abruptly. My mom is shaking me, telling me I have to get ready for our appointment. But yes, that was the most awesome b*tchfight ever. I am outside my house, and it is nighttime. I can't remember what I'm doing, but I notice that the houses have a weird yellowish glow to them. I think to myself, "Haha, it's like a dream! Wait..This is a dream!!" I get lucid, and try to think of my goals. I remember my goal to have a table flip me, since I had already flipped a table before. I summon a table. I look away and back, and it is there. It is a square wooden table, the kind you see at picnics with the long seat attached to it. I walk up and stand on it. I put my feet apart, in a fighting stance. Then I yell "DO IT!" Nothing happens. What a fail. I ease up on my stance and decide to get down and do something else. I take a step down on the attached seat, using it as a ladder. Just as I'm doing so, the whole table flips! FFUUUUUUUUUU!! And it flips really hard too. I get thrown across the ground, and land face first, and it hurts. A lot. Probably because I didn't have time to imagine it wouldn't. I stand up and brush myself off. The table has vanished. I walk to the nearest house and open the door, planning to use it as a portal to change dreamscapes. It doesn't work. I enter the house normally and see many DCs watching tv. I think about yelling out for my dream guide, so I ask "Is my dream guide here?" They all look at me, and one of them says, "Her name is Claire." I am puzzled. But that's Oreoboy's DG! They ask me if I wanna join them, as they seem to be watching Courage the Cowardly Dog on the tv. I think I start losing lucidity here. I say yes, though I'm not sure why. I proceed to sit on the floor where about 5 other people are squatting. I remember laughing at something on the show, before I totally lose lucidity and drift into some nonlucids before waking up.